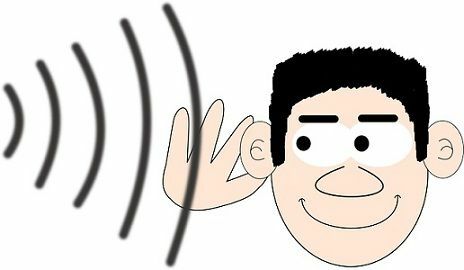 Someone rightly said, “Hearing is through ears, but listening is through the mind.” The two activities hearing and listening involve the use of ears, but they are different. The hearing is nothing but a sense that helps you receive sound waves and noise by ears. It is the power of perceiving sounds. On the contrary, listening is when you receive the sound waves and understand it by paying full attention to the words and sentences of the speaker. It is one’s ability to correctly receive and interpret the message transferred by the other party in the process of communication. For many people, these two activities are one, but the truth is, the difference between hearing and listening is vital. so have a glance at this article to understand the terms completely. Meaning Hearing refers to one's ability to perceive sounds, by receiving vibrations through ears. Listening is something done consciously, that involve the analysis and understanding of the sounds you hear. Involves Receipt of message through ears. Interpretation of the message received by ears. Reason We are neither aware nor we have any control over the sounds we hear. We listen to acquire knowledge and receive information. The natural ability or an inborn trait that allows us to recognize sound through ears by catching vibrations is called the hearing. In simple terms, it is one of the five senses; that makes us aware of the sound. It is an involuntary process, whereby a person receives sound vibrations, continuously. A normal human being’s hearing capability ranges from 20 to 20000 Hertz, called as audio or sonic. Any frequency above and below the given range is known as ultrasonic and infrasonic respectively. Listening is defined as the learned skill, in which we can receive sounds through ears, and transform them into meaningful messages. To put simply, it is the process of diligently hearing and interpreting the meaning of words and sentences spoken by the speaker, during the conversation. Listening is a bit difficult, because it requires concentration and attention, and the human mind is easily distracted. People use it as a technique to comprehend, what is being said, through different verbal and non-verbal signs, i.e. how it is being said? What type of words is used? Tone and pitch of voice, body language and so on. Active listening is the key element; that makes the communication process effective. Further, it encompasses making sounds that show listener’s attentiveness and providing feedback. It had a greater influence in our lives and used to gain information, learn and understand things and so on. An individual’s ability to perceive sounds, by receiving vibrations through ears, is called the hearing. Listening is something done consciously, that involve the analysis and understanding of the sounds you hear. The hearing is the primary and continuous in nature, i.e. the first and foremost stage is hearing, followed by listening and it occurs continuously. On the other hand, listening is temporary, as we cannot continuously pay attention to something for long hours. The hearing is physiological, which is through one of our senses in the living organisms. On the contrary, listening is a psychological (conscious) act. While hearing is a passive bodily process that does not the involve use of the brain. As opposed to listening, it is an active mental process, which involves the use of brain to draw meaning from words and sentences. Hearing involves receipt of the message through ears. Conversely, listening encompasses interpretation of the message received by ears. The hearing is an inborn ability but listening is a learned skill. In the hearing, we are not aware of the sounds that we receive, however in the case of listening, we are completely aware of what the speaker is saying. Hearing involves the use of only one sense i.e. ears. In contrast, listening, involves the use of more than one senses i.e. eyes, ears, touch etc. to understand the message completely and accurately. In the hearing, we are neither aware nor we have any control over the sounds we hear. On the other hand, in listening, we are aware of what the other person is saying and so we listen to acquire knowledge and receive information. Hearing does not require focus whereas listening does. So, with the discussion, it is quite clear that listening is one step ahead of the hearing. The hearing is simply the ability to hear, i.e. natural or God-given however, listening is an acquired skill, which only a few people possess. While the hearing is involuntary and performed effortlessly, listening is done intentionally, wherein we are selective and pay attention to only those messages, we think important for us. Thanx it’s very useful for me..